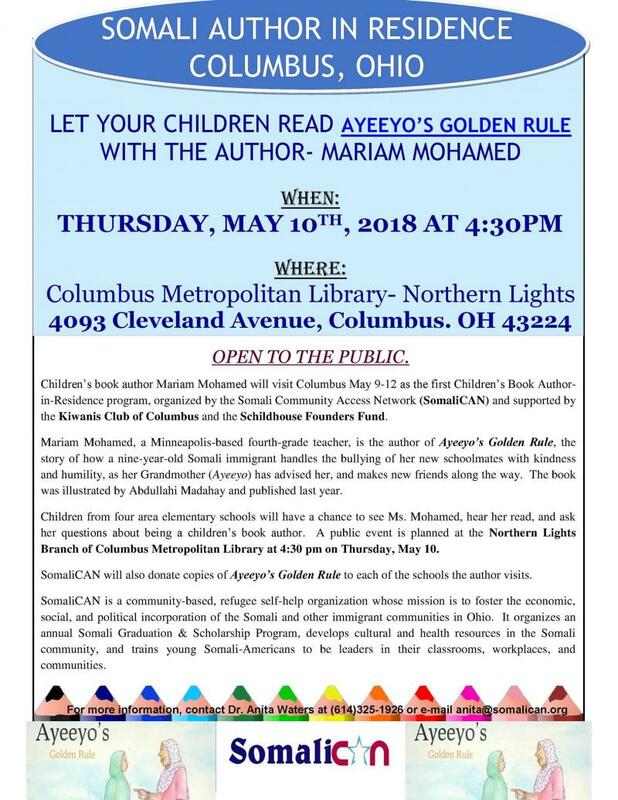 SomaliCAN - 2018 Somali Graduation and Scholarship ProgramAyeeyo's Golden RuleSomaliCAN is honored and excited be hosting Mariam Mohamed in our first children's book Author-in-Residence at elementary schools this May.﻿Somali Forum on Immigrationhttps://www.facebook.com/events/1615691318493533/﻿﻿Ohio's Annual Somali Graduation Now Has More Students To Celebrate﻿﻿8th Annual Ohio Somali Graduation & Scholarship DinnerJuly 7th, 2017 at 6:00pm - 9:30pm at Hilton Columbus at Easton, 3900 Chagrin Drive. Somali Community Conversation with Federal Officialshttps://www.facebook.com/events/432561647124402/﻿ Somali Civic Participation Forum at the Ohio Statehouse ﻿Columbus has the second-largest concentration of Somali immigrants in the U.S., following Minneapolis, which has almost double the population. Stefanie Chambers, who compared the two in her book "Somalis in the Twin Cities and Columbus," says Columbus still lags behind in incorporating Somali-Americans into the community.Chambers, who received her Ph.D. from The Ohio State University in 1999, gave the keynote speech for the Somali Civic Participation Forum at the Statehouse on Monday evening. 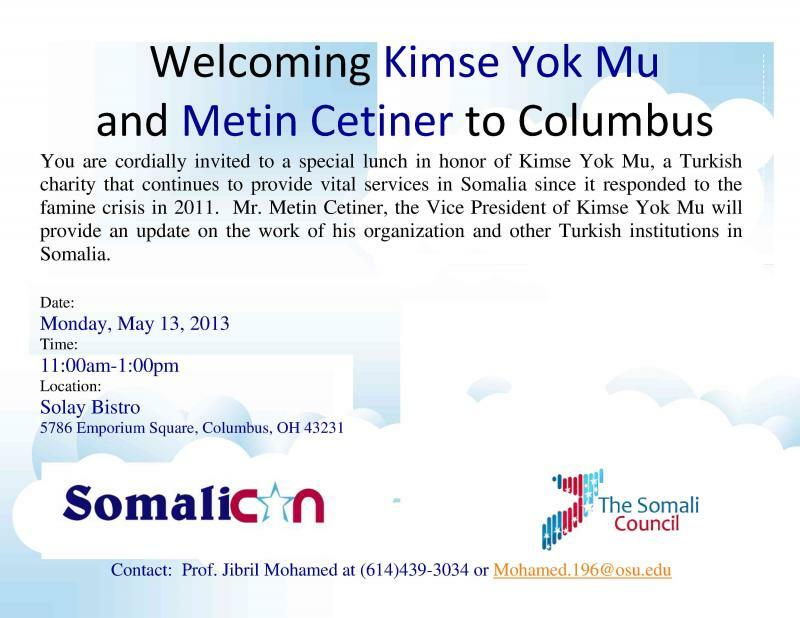 ﻿﻿ ﻿ ﻿ The 4th Annual Ohio Somali Graduation and Scholarship Welcoming Turkish Charity Kimse Yok Mu to Columbus, Ohio: May 13, 2013 Welcoming Dr. Hawa Abdi and the Dr. Hawa Abdi Foundation to Columbus:Book Signing @OSU Union on Friday, April, 12, 2013 at 2:30pm-4:30pm.Thank you Dinner and Book Signing @Solay Bistro on April 12, 2013 at 6:pm. OSU PRESIDENT'S DIVERSITY LECTURE:REMEMBERING SOMALIA: A WRITER SPEAKS.NURADIN FARAHTHURSDAY, SEPTEMBER 13, 2012 @ 4:30PMSAXBE AUDITORIUMDRINKO HALL55 WEST 12TH AVENUECOLUMBUS, OH 43210.Click here for the flyer. The third annual ohio somali graduation, teachers' workshop$ scholarship program We are pleased to invite you to join the Somali community in the most prominent Somali event in Ohio celebrating the academic achievement of Somali American high school and university graduates. 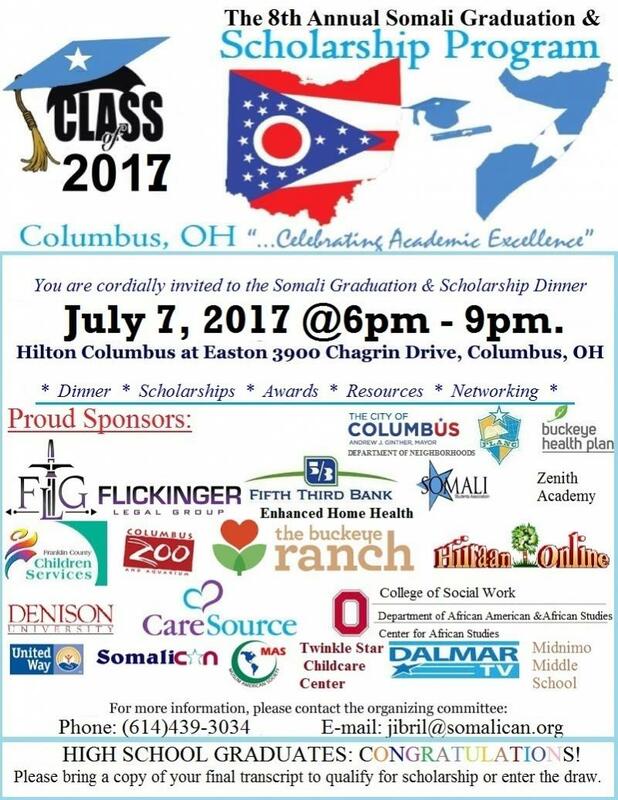 The Third Annual Ohio Somali Graduation and Scholarship Program will be held on Friday, June 29, 2012 at 5:30pm-10:00pm at Aladdin Conference Center, 3850 Stelzer Road. The graduation will bring together hundreds of students, parents, professionals and leaders from the state of Ohio and national leaders in education. Invited dignitaries include Ohio Governor John Kasich, Columbus Mayor Michael Coleman, Columbus Schools Superintendent Dr. Gene Harris; Westerville Schools Superintendent Dan Good, Southwestern Schools Superintendent Bill Wise, Governors Director of Minority Affairs Lynn Stevens, representatives from the Ohio State University, Ohio University, Columbus State, Denison University, Capital University, Franklin University, Ohio Department of Education, and other county, state and state officials. Somali community leaders and educators including the first African man to receive a PhD from Princeton University and former Ministers will be honored at the event. In addition to financial scholarships by the Law Office of Russell Flickinger, Presidential Service Awards will be conferred on members of the Somali-American community in recognition of their contributions to the community. In previous years, the event attracted media coverage by the Associated Press, BBC, Voice of America, Columbus Dispatch, NBC4, Cleveland.com and other local and international media. Somali graduates in Ohio, their parents, and friends are cordially invited to be honored in this beautiful celebration of education excellence by the Somali American community. Should you need more information about the event, please do not hesitate to call 614-439-3034 or send an e-mail to Graduate@SomaliCAN.org. We look forward to seeing you on June 29, 2012 at 5:30pm at Aladdin Conference Center, 3850 Stelzer Road. usaid invitation: july 4, 2012Join a roundtable discussion with USAID staff on stablization initiatives in Somalia on July 4, 2012 at Solay Bistro. Click on the title to download the event flyer. roundtable with ambassador donald yamamotoPrincipal Deputy Secretary of State for African Affairs,US Department of State On Wednesday, May 16, 2012, (2:00-3:30pm) a delegation from the U.S. Department of State, led by Amb. Donald Yamamoto, the Principal Deputy Assistant Secretary of State for African Affairs will be in Columbus, Ohio for consultation with the Somali community in Ohio about ...the end of transition process and expansion of AMISOM troops in Somalia.Somali Law Enforcement Advisory Group MeetingFeatured Speaker Ambassador YamamotoWednesday, May 16, 201211:00a.m - 1:30p.m: Lunch with Leaders at Solay Bistro.2:00 p.m. 3:30 p.m.Ohio Department of Developmental Disabilities building 1601 W. Broad StreetColumbus, OH 43223Bio:Donald Y. Yamamoto, Ambassador Principal Deputy Assistant Secretary, Bureau of African Affairs Donald Yamamoto's prior assignments included serving as the U.5. Ambassador to the Federal Democratic Republic of Ethiopia from November 2006 to July 2009. He also served as Deputy Assistant Secretary of State in the Bureau of African Affairs from 2003 to 2006, where he was responsible for coordinating U. S. policy toward over 20 countries in east and central Africa. He served as U.S. Ambassador to the Republic of Djibouti from 2000 to 2003 and was the Deputy Director for East African Affairs from 1998 to 2000.Ambassador Yamamoto entered the Foreign Service in 1980. Former assignments include U.S. Embassy Beijing as Ambassador's staff aide and Human Rights Officer during the Tiananmen Square demonstrations in 1989; Japan as Principal Officer of the Fukuoka Consulate; and Eritrea as Charge d'Affaires at U.S. Embassy Asmara in the Horn of Africa. He attended the National War College in 1996 for senior training and received a Congressional Fellowship in 1991.Ambassador Yamamoto is a graduate of Columbia College and did graduate studies at Columbia University, receiving a Master's degree in International Affairs. He has studied Chinese, Japanese, Arabic, and French. During his Foreign Service career, he has received four individual Superior Honor awards, two group awards and the 2006 Robert Frasure Memorial Award for advancing conflict resolution in Africa.Directions to the meeting: To get to the Ohio Department of Developmental Disabilities building, you have to turn off Broad St. onto the I-70 East Bound Entrance Ramp. There will be a small green sign under the Freeway entrance sign that says 1601 W. Broad St. The driveway is off to the right before entering the freeway. The building is at the top of the hill and marked Administration. If you pass the turn-off ramp, you will enter onto the freeway and will have to get off at the next exit and backtrack. Federal Official Urges Local Somalis to Aid their Broken Country: The Columbus Dispatch.somalia at Crossroads Conference:Foreign Intervention, Humanitarian Crisis and Aspirations for StatehoodJanuary 27-28, 2012The Ohio State UniversityColumbus, OhioFinal CommuniqueNews Articles:OSU summit seeks solutions to Somalias woesBy Mark Ferenchik The Columbus Dispatch Thursday January 26, 2012 11:15 PMSomalia, which hasnt had a national government in more than two decades, faces a host of complex problems including famine, religious extremism, piracy and a flood of refugees.Friday and Saturday, local Somali leaders and academics and State Department representatives will meet at Ohio State University to discuss these problems and how they affect the U.S. and Somalis who have moved here.Somalia at Crossroads: Foreign Intervention, Humanitarian Crisis and Aspirations for Statehood, will include speakers discussing U.S. policy, the ongoing humanitarian crisis and difficulties in sending money to relatives there.The possibility of the country breaking into small hostile regions also will be discussed. Somalia needs to be united or the ongoing problems will simply be exacerbated, said Abdinur Mohamud, a consultant for the Ohio Department of Education.There has to be a solution that brings all those territories together so regions and communities can function at the local level, said Mohamud, a member of the organizing committee. He served as Somalias minister of education for nine months until the prime minister was forced out in June.Mohamud said he hopes what is discussed in Columbus can be taken to a conference this year in London.Why not take the initiative ourselves, with the idea of bringing our people together, getting the government of the U.S. involved, get something concrete, and come up with some recommendations, said Jibril Mohamed, who leads the Somali Community Access Network in Columbus.At 7 on Friday night, Deborah Malac, director of East African Affairs for the State Department, and Abukar Arman, Somali envoy to the U.S., are scheduled to speak about U.S. policy in Somalia at the Mershon Center for International Security Studies, 1501 Neil Ave.Other events are set for Hagerty Hall, 1775 College Rd., Friday morning and Saturday, and Denney Hall, 164 17th St., for Friday afternoon sessions.For more information, go to http://somalia.eventbrite.com/.mferenchik@dispatch.com*************************************************************************************************************************************************************************Conference seeks to end violence, bloodshed in SomaliaBy Kevin Parks ThisWeek Community Newspapers Wednesday January 25, 2012 1:39 PMColumbus is home to many who fled the anarchy into which the African nation of Somalia descended beginning in the early 1990s.Now, in 2012, the city may be home to the beginnings of an end to the violence and bloodshed that continues to wrack the country.A conference entitled Somalia at Crossroads: Foreign Intervention, Humanitarian Crisis and Aspirations for Statehood will be held from 9 a.m. to 5 p.m. Jan 27 and 28 in Hagerty Hall, 1755 College Road, and Denney Hall, 164 W. 17th Ave., both on the campus of Ohio State University.Conference sponsors include the Ohio State University Somali Language Program, Center for African Studies at OSU, Mershon Center for International Security Studies, African Studies Program at Ohio University, Columbus Council on World Affairs, Somali Community Access Network, Somali Education Association and U.S. Global Leadership Coalition.Somalia has been in a state of violence and conflict for over two decades now, Jibril Mohamed, president and chief executive officer of the Northland-based Somali Community Access Network, said last week. Many attempts were made to bring together the sides that were fighting for power in Somalia. So far, almost all of them are not successful.Approximately 16 conferences have been held in recent years in a variety of countries surrounding Somalia and in the Middle East, Mohamed added.All of those resulting in nothing much more than a transitional system that was not functioning, he said.The local conference seeks to bring together intellectuals, Somali and non-Somali, who have a deep understanding of whats going on in the strife-torn nation, he indicated.They envision ways to handle that conflict and end it once and for all, Mohamed said.Ambassador Johnnie Carson, Assistant Secretary of State for Africa at the U.S. State Department, was invited to be one of the speakers but will not be able to attend, according to Mohamed. However, he will be represented by a delegation of officials from the State Department.Confirmed speakers include:Professor Ahmed I. Samatar, the James Wallace Professor of International Studies at Macalester College in St. Paul, Minn.Professor Michael Weinstein, Somalia analyst at Purdue UniversityAbdinur Sheikh Mohamed, former minister of education in SomaliaAbukar Arman, Somalias special envoy to the United StatesAbdikarim Gole, Somali language lecturer at Ohio StateKhadra Mohamed of the Center for Somali Womens AdvancementElected state and local officials have also been invited to address the conference.The conference has three major goals, according to Mohamed.The first is to produce a communiqu by the end of the gathering stating the position of conference attendees on the way to move forward after the current transitional government in Somalia ceases in August.Second will be to bring to the attention of policymakers, including those in the U.S. State Department, the frustration Somali-Americans feel regarding the continued violence in their homeland.And third, Mohamed said, will be to show that Columbus and its Somali community are powerful, capable of thinking about our motherland and finding solutions for them, and following them up with actions.Thats the country that gave us the life that we have, Mohamed said. Thats where we were born. Most Somalis have relatives and friends in Somalia.There is a great connection between the Somali-Americans and the Somalis living in Somalia.Key presentations at the conference, which is free and open to the public, will include:Foreign Intervention, Humanitarian Crisis and the Quest for Political Stability in SomaliaU.S. Engagement in Somalia: Dual Track Policy Aims and ImplicationsDebunking the Roadmap: A Tool for Statehood or Death-knell for Disintegration?Natural vs. Manmade: The Politics of Famine in the HornPost-Transitional Federal Government Somalia: Political Parties and National Grassroots Movements as Clan Alternatives: Planting the Seeds for Sustainable Social and Political Institutions.U.S. policy on Somalia gets mixed reviews **************************************************************************************************************************************************************************************** Conference draws differing opinionsBy Deanna Pan The Columbus Dispatch Saturday January 28, 2012 6:27 AMFor decades, Somalia has been plagued by myriad problems famine, violence, piracy and thousands of refugees and not everyone agrees on how to solve them.During a panel discussion yesterday at Ohio State University, centered on U.S. engagement in Somalia, speakers were critical of the current administrations policy aims.The most-important part is the security of the Somali people themselves, said panelist Jibril Mohamed, CEO and president of the Somali Community Access Network in Columbus.Theres no policy of securing the people; its the Somali people who suffer the most. Its the Somali people who are the victims. Somali people are dying in droves from famine and violence. There needs to be a comprehensive policy that takes into account the Somali peoples needs.Mohamed helped organize the conference, Somalia at Crossroads: Foreign Intervention, Humanitarian Crisis and Aspirations for Statehood.The Obama administration has pursued a dual-track policy toward Somalia since 2010. Under this approach, the U.S. supports the weak transitional government while simultaneously engaging local and regional leaders to cultivate peace and stability.Deborah Malac, director of the U.S. State Departments Office of East African Affairs, defended U.S. policy at a press roundtable after the panel discussion.We would argue that there is demonstrated progress and success for the dual-track policy, Malac said. But as we do with any policy we look at the situation on the ground and make determinations on when and whether we need to make adjustments to that policy. It is going to be a painstaking process to move things forward in a positive direction.Malac was invited to give the keynote address last night at the conference, which will conclude today. She added that U.S. Somalis many thousands of whom live in Columbus have an important role to play in determining policy.We understand that having a connection to them is something we need to do to ensure that we have that flow of ideas or an understanding what the impact of what our policies might be, she said, adding that violence is a major concern among Somalis. They take every opportunity to try to get that message to us to put pressure on us to keep doing something.Mohamed said he was one of two Somalis invited to attend a 2010 forum at the White House, where the president unveiled his administrations strategy in Somalia. Mohamed said he hopes Somalis will have the opportunity to actively shape alternative plans.Receiving the input of the Somali diaspora and Somali intellectuals, Somali activists and Somali technocrats would be essential to obtaining a policy that is feasible and sustainable, he said.Deanna Pan is a fellow in the E.W. Scripps School of Journalism Statehouse News Bureau. ****************************************************************************************************************************************************Ohio conference discusses Somalia future, problemsJan. 27, 2012, 3:02 a.m. ESTAPCOLUMBUS, Ohio (AP) Somalia's numerous problems, from piracy to humanitarian suffering to receiving money from overseas immigrants, are the subject of a two-day conference at Ohio State University.The previously scheduled conference comes just days after U.S. special forces rescued two hostages inside Somalia and killed nine captors in the process.The Somalia at Crossroads conference begins Friday and includes Somali officials, academic experts and a representative from the U.S. State Department.Columbus has as many as 20,000 Somali residents, the country's second-largest population after Minnesota. Final Communique of the Somalia at a Crossroads Conference (Click Here) 10TV: Dr. Abdinur, Fowzia, Darby Universal TV: Somalia at Crossroads Conference BBC Somali Service: Khadra Mohamed VOA Somali Service: Jibril Mohamed BBC Somali Service: Jibril Mohamed Columbus Dispatch: OSU Conference Seeks Solutions ThisWeek News: Conference Seeks to End Bloodshed OSU Mershon Center for International Security Studies NBC: Ohio Conference Discusses Somalia Future CONFERENCE PROGRAM:(click here) Somalia at the Crossroads Conference: Foreign Intervention, Humanitarian Crisis and Aspirations for Statehood. The Ohio State University. Columbus, Ohio, USA. January 27-28, 2012, 9am-5pm. Please visit www.somalia.eventbrite.com to register for the conference. For additional details, contact: Mr. Jibril Mohamed (614)439-3034 or Jibril@SomaliCAN.org, Mr. Abukar Osman- Baalle (614) 769-8810 or Ms. Laura Joseph at OSU 614-292-8169. Download the flyer here. http://mershoncenter.osu.edu/events/11-12events/Jan12/somalicanconfjan27.htm ***********************************************************************************CONFERENCE PROGRAM (CLICK HERE) Somalia at Crossroads:Foreign Intervention, Humanitarian Crisis and Aspirations for StatehoodJanuary 27-28, 2012, 9:00AM-5:00PMThe Ohio State University- Columbus, OhioHagerty Hall, 1775 College RdDenney Hall 164 W 17th avenueThis two-day conference will bring together some of the brightest minds in Somali affairs with the aim of deepening public discourse and understanding of the complex situation in Somalia and developing strong, pragmatic, and principled policy recommendations for, post-transition political development in Somalia. Issues discussed include the national roadmap, piracy, humanitarian crisis, frontline state military interventions, Diaspora remittance challenges and community development issues. Key presentations include: * Foreign Intervention, Humanitarian Crisis and the Quest for Political Stability in Somalia * U.S. Engagement in Somalia: DualTrack Policy Aims and Implications * Debunking the Roadmap: A Tool for Statehood or Death-knell for Disintegration? * Natural vs. Man-made: The Politics of Famine in the Horn * Post TFG Somalia: Political Parties and National Grassroots Movements as Clan Alternatives: Planting the Seeds for Sustainable Social and Political Institutions, and more. For additional details, contact: Mr. Jibril Mohamed (614)439-3034 or Jibril@SomaliCAN.org, Mr. Abukar Osman- Baalle (614) 769-8810 or Ms. Laura Joseph at OSU 614-292-8169.Confirmed Kenynote Event:Friday January 27, 201207:00-08:30PMU.S. Involvement in Somalia: A Policy of Tacit Engagement or Disengagement?Deborah Malac, Director, East African Affairs-State Department; and Abukar Arman, Somalia Envoy to the United States Moderator: Jibril MohamedMershon Center for international Security Studies, the Ohio State University. For more information including directions, please CLICK HERE.Download the flyer here. Ambassador James Swan's discussion with the Somali Diaspora- Columbus,Ohio Wednesday November 9, 2011 Time: 2:00 - 4:00pm Location: Monacos Place (Libaaxyada) 4555 Cleveland Avenue, Columbus, OH 43231 Audience: Members of the Central Ohio Somali Community Time: 4:30pm-6:30pm Location: The Ohio State University Mershon Center for International Security Studies1501 Neil Ave. Columbus, OH 43201 Phone: (614) 292-1681 Audience: Students, Faculty, and Community Members United States Special Representative for Somalia, Ambassador James Swan will discuss Americas Dual Track Engagement Policy for Somalia. His remarks will provide an overview of Americas role in supporting humanitarian, development, and security assistance in Somalia. He will also address U.S. programs designed to promote good governance, transparency and accountability within Somalias transitional federal and regional administrations. Ambassador Swans remarks will be followed by a question and answer session. Ambassador James Swan has served as the United States Special Representative for Somalia since August 2011. He has served with the State Department since 1988 in Djibouti, Democratic Republic of the Congo, Republic of Congo, Cameroon, Haiti, and Nicaragua, as well as Deputy Assistant Secretary of State for African Affairs (2006-2008). For details, please contact Jibril Mohamed at (614)489-9226 or SomaliCAN@gmail.com or Laura Joseph at cas@osu.edu. Speech by U.S. Special Representative for Somalia Ambassador James C. Swan at Ohio State UniversityNovember 9, 2011Ladies and Gentlemen, Im pleased to have the opportunity to speak with you tonight in Columbus -- a city that is one of the most important centers of the Somali diaspora in the United States. Somalis in America are not only active contributors to their newly adopted communities, but also continue to follow, and more importantly, influence developments in Somalia. So it was a priority for me to engage in a dialogue and learn from the Somalia diaspora in the first few months of my new assignment as the U.S. Special Representative for Somalia. The difficulties that beset many parts of Somalia today: chronic instability, weak governance, famine and terrorism, have led some commentators to say that America should scale back its engagement with Somalia. They see heart-breaking news coverage of malnourished Somali children, read about bright young college students murdered by suicide bombers, or hear reports of wide-scale corruption and say that Somalia cannot be helped. The problems Somalia faces today, the critics say, are the same problems it has faced for twenty years. They are intractable, they are expensive their argument runs so why bother? U.S. Interests in Somalia The answer is simple: Americas national interests require robust engagement with Somalia. As a compassionate society, the United States has an interest in addressing the acute humanitarian needs of our fellow human beings in Somalia. As part of our global commitment to advancing democratic values and improved governance, we have an interest in promoting political reforms that allow Somalis to be represented by leaders who will govern for the benefit of the people and the development of the country. The United States also has direct security interests in Somalia. The combination of instability and poor governance threatens not only the Somali people, but the security of our regional partners in the Horn of Africa and beyond. These factors have led to the most serious piracy problem in the world on key international trade routes. They have also created a dangerous terrorist organization al Shabaab that wantonly attacks innocent civilians and African peacekeepers, has conducted terrorist attacks against Somalias neighbors, and has actively recruited American citizens. For all these reasons humanitarian, democracy and governance, and cold-eyed security concerns America is committed to helping Somalia regain stability and security. While Somalia faces enormous challenges, it also has, to quote President Obama, enormous support from the people of the United States. A Vision for Success in Somalia We are committed to working with Somalis and the international community to help develop indigenous, long term solutions to the countrys ongoing problems. America, as President Obama also said, wants Somalia to succeed. Success means that Somalis facing drought and famine are helped to survive the current crisis and are given the long-term tools to better withstand future droughts. Success means that Somalia is free from totalitarian terrorist groups like al Shabaab, which is responsible for many lost and shattered lives not only in Somalia, but in Kenya and Uganda, through its terror attacks and through its policy of banning humanitarian assistance. Success means that Somalis can turn to their government for the basic services that we take for granted in America. It means that humanitarian and development assistance goes where it is needed and not into the pockets of corrupt officials or the armories of warlords and terrorists. And success means that the Somali people get to decide what form of government and constitution they will have. Poll after poll shows that the Somali people want self-determination, even if they are unclear exactly how that democracy should look. Our role is to support the Somali people as they arrive at these decisions. The Current Humanitarian CrisisLet me turn first to the current humanitarian crisis, which has been so much in the headlines in recent months. The scale of the crisis is shocking. Nutritional data released by the Food and Agriculture Organization in early September spoke of 4 million people in need of assistance in Somalia alone, with more than three times that number at risk elsewhere in the region. To address the immediate crisis, the United States has provided over $750 million to meet ongoing and urgent humanitarian needs in the region. Approximately $175 million of those funds are for humanitarian assistance within Somalia. Our dollars and diplomatic leverage are also being used to provide protection and assistance for Somali refugees in Kenya, Ethiopia, and Djibouti. While America is the largest donor of humanitarian assistance to the Horn of Africa But, we are not alone. European partners, Turkey, Gulf Cooperation Council countries, China, Japan, and many others have all responded to Somalias urgent need. Together, we have met nearly 80 percent of the $1 billion UN Consolidated Appeal for Humanitarian Assistance for Somalia, the highest percentage reached of any appeal in the world today. In addition to aid from governments, there have been significant contributions from private citizens and NGOs from around the world. In many respects, our core humanitarian challenge is not only to continue to mobilize the necessary resources, but also to ensure that all donors and implementing agencies are coordinating their response for maximum efficiency and effect.The areas worst affected by the famine are not coincidentally those where the extremist group al-Shabaab is most influential. Though assistance is beginning to reach these areas, coverage is uneven and continues to be impeded by al-Shabab in many places. We call on al-Shabaab to remove urgently all remaining obstacles to aid delivery in areas where they are present. Although humanitarian access is far better in areas of Transitional Federal Government presence, we believe this could be further improved through efforts to establish more effective TFG aid-coordination systems and address the problem of small armed bands that control entry to some Internally Displaced Persons (IDP) sites. The TFG should make areas it controls a model of effective aid delivery. There is also something that you can do. You may be surprised to know that more than 54% of Americans have no idea there is even a crisis in the Horn of Africa region. To highlight the devastating crisis, USAID, working with the Ad Council, launched the F.W.D. or forward campaign for the Horn of Africa. F.W.D. stands for Famine. War. Drought. - the three factors that make the crisis so severe. Today, November 9th, is FWD>Day a national day of action for Americans. Today we are asking that 13.3 million people, the same number of people impacted by the crisis, take action to raise awareness for the Horn of Africa. We are asking people to take an action by (1) posting messages on Facebook and Twitter about the crisis, (2) making your own FWD video on YouTube, and (3) texting Give to 777444 to donate $10. U.S. Dual Track Policy after One YearBeyond the immediate crisis, our primary vehicle for advancing broader U.S. interests in Somalia is the Dual Track policy announced on October 20, 2010 by Assistant Secretary of State for African Affairs Johnnie Carson. Under Dual Track, our diplomatic engagement and development assistance for Somalia is steadily increasing. This year alone the United States we will provide over $250,000,000 dollars for Somalia. These funds support a vast array of programs, across the entire country, that address security, peace and reconciliation, conflict mitigation, good governance, justice, democracy, education, economic growth, private sector competitiveness, health, water sanitation, food security, nutrition, and protection for vulnerable peoples. Track one of the Dual Track policy reaffirms Americas continuing support for making the Transitional Federal Institutions more effective, more inclusive, and better able to provide services to the Somali people. Track One is consistent with our support for the Transitional Charter and Djibouti Peace Process. Track one also reaffirms our continued support for the African Union Mission in Somalia (AMISOM) peacekeepers who defend those institutions. The Second Track of Dual Track broadens our engagement with regional and local administrations, civil society groups, and communities across the country that share the same goal of defeating al-Shabaab and bringing peace and stability back to Somalia. In reality, the Second Track announced last year codified efforts that were already underway to expand outreach to communities and organizations that were creating pockets of stability and improved governance. Key administrations and organizations we engage under Dual Track include Somaliland, Puntland, Galmuduug, Ahlu Sunna wal Jamaa, other local administrations, and civil society groups. The past year has seen important progress on both tracks of Dual Track. On Track One, the Transitional Federal Government and AMISOM have succeeded in retaking ninety-eight percent of Mogadishu from al-Shabaab. This is a significant accomplishment in the security arena and one that has led to increased humanitarian access in newly liberated parts of the city. Mogadishu has been the scene of the fiercest battles in the country as al Shabaab struggled to keep its grip on the city that remains the economic heart of the country and has historically been its political epicenter as well. While al Shabaab has lost territory and support over the past year, it remains a very dangerous organization within Somalia and our support to the Somali forces and the Ugandan and Burundian troops deployed alongside them in Mogadishu will continue. The United States supports the Somali National forces with stipends, training, and equipment, and has also provided the lion's share of equipment and training for the AMISOM troop-contributing countries ever since their first deployment in 2007. On the second track, we have increased outreach and support to key regional administrations and local governments across the country that are providing stability and services and countering al-Shabaab. Somaliland, for example, emerged from a successful presidential transition last year, a process the United States supported with over $700,000 in assistance. Having clearly progressed on democratization, the Somaliland administration has also successfully attracted new investment. That is why the United States more than doubled its assistance to Somaliland under Dual Track, going from about $8 million in 2009 to more than $20 million in 2010. This funds programs focused on local government administration and planning, education, community development initiatives, and economic growth. We plan to extend the same type of Track Two community development assistance programs to Puntland, Galmuduug, and accessible areas of Gedo Region in the coming months. Even in Mogadishu, our quick impact community-focused projects are channeled through the Benadir Administration in order to reinforce local ownership and keep the projects close to the people. We know Dual Track also has its critics. Some claim the policy has undercut the influence of the Transitional Federal Government, but this ignores our continued support to both the TFG and AMISOM. There are those who claim Dual Track further Balkanizes Somalia, pointing to opportunists who quickly self-declared newly independent states states that often represent little more than a hastily-posted website in a foreign capital. The Second Track is in no way an open-ended commitment to assist any regional entity. We are focused on looking for opportunities to help political structures that enjoy real legitimacy with their constituents and have a record of building pockets of stability within Somalia and responding to the people. We want to help Somalis living in such communities, even while Somalis as a whole decide what sort of relationship they want between their central and regional governments. When it comes to recognizing new African states, America follows the African Union lead -- and the African Union supports a single Somali state. On both tracks, we will continue to provide training to local authorities and targeted Transitional Federal Institutions to promote credibility and confidence in the peace process. This includes funding activities to support constitutional and democratization processes across the country. It also includes training, often with the expertise of Somali diaspora like yourselves, to promote government transparency and responsiveness. A great recent example includes a member of the diaspora who returned to work with the TFG. He identified $1 million dollars in lost assets, funds which belonged to the defunct Somali national airlines that were sitting unused in banks, and restored these assets the national budget. Road Map Let me turn now to the national political process. Ultimately the ability of Somalia to address future humanitarian challenges; improve security for its people; and pursue a strategy for development of the country will require resolution of political conflicts and establishment of functional governing institutions. If Somali political leaders want to garner credibility with the Somali, they must capitalize on the improving security environment to make significant progress in both the political and governance realm. Many Somalis still express a deep skepticism about the Transitional Federal Institutions ability or willingness to govern in a representative, responsive and accountable manner. Much of their frustration comes from the perception that the Transition Federal process begun in 2004, which was supposed to provide the constitutional, electoral and parliamentary foundation for a new Somalia, has become hopelessly stalled. In the eyes of many of their constituents, the political leadership in Mogadishu has become complacent with the status quo, and the benefits it affords those in power, rather than committed to progress that will help the average Somali. On September 6, however, these Somali leaders created a unique opportunity to change that perception. On that day, Somali leaders from the Transitional Federal Government, the regional administrations of Puntland and Galmuduug, and the Ahlu Sunna Wal Jamaa movement signed the Roadmap for Ending the Transition in Somalia. It is a hopeful indication that previously competing administrations see the benefit of coming together to end the static transition period that increasingly serves the interests of the few at the expense of the many. Although the Roadmap includes a complex list of tasks and deadlines to be met that may be overly ambitious, its broad thrust of (1) improving security, (2) extending political outreach to all regions, (3) completing the constitution, and (4) ensuring representative institutions and good governance is right on target.The Roadmap has given new impetus to the completion of key transition tasks such as the drafting of a constitution, and electoral and parliamentary reform.But some Roadmap deadlines have already slipped and it is urgent that senior Somali political leaders from the signatory parties together actively provide political direction to spur the process forward. The terrible suffering of the Somali people, particularly during the current famine, underscores that the signatories must make rapid progress toward representative and effective governance that can meet the basic needs of all Somalis. We are closely monitoring progress on the Roadmap. We will continue to support the efforts of those who strive to achieve its goals and bring stability back to Somalia. Equally, we will work with our regional and international partners to hold accountable those Somali officials who obstruct progress. Final ThoughtsFor all the challenges Somalia continues to face, we have seen positive though still fragile results from the efforts that we and our Somali, African, and international partners have expended. This years humanitarian response has been massive, and now needs follow-through and improved coordination to ensure the necessary effect. In the security arena, momentum has shifted from al-Shabaab to the TFG and AMISOM -- although al-Shabaab still remains dangerously capable of asymmetric attacks. Politically, the Roadmap offers a positive vision for the end of the transition and also the prospect of convergence between the national government and regional entities, but it needs strong direction by Somali political leaders and active regional and international engagement to keep it on track. There is of course still much work to be done to address all of these challenges. It is time for all of us -- especially those in the diaspora -- to add our voices to those of the millions of Somalis calling for end the transition period and a new era of security, inclusiveness, and development in which Somalia can rebuild.Thank you. Local Somalis encourage envoy to their homeland Immediate U.S. action needed, they tell special representativeBy Mark Ferenchik The Columbus Dispatch Thursday November 10, 2011 3:50 AM James C. Swan, the new U.S. special representative for Somalia, wanted to hear from Columbus Somalis about U.S. policy in their homeland.For some in the Somali diaspora, Swans appointment indicates to them that the United States is willing to take a lead in helping to resolve the many problems that have fractured the war-torn country for 21 years. Abdi Issa was direct when he spoke to Swan. You have an opportunity to make it or break it, Issa told Swan. He wants the United States to provide more humanitarian support to help stabilize the country. We need an American action immediately, said Issa, who is a village council member in Urbancrest. You have all of our support. Swan was appointed in August and is based in Nairobi. He came to Columbus to speak with about 60 Somalis at Monacos Palace in the Northland area.The Obama administration has pursued a dual-track policy of supporting the weak transitional government while talking to leaders in regions such as Somaliland and Puntland anyone who isnt supporting the extremist al-Shabab group that is linked to al-Qaida.Al-Shabab has been battling transitional government and African Union peacekeeping forces while thwarting relief aid from reaching the people who need it.The United States has provided $750 million in humanitarian aid to drought-stricken regions in the Horn of Africa, reaching 4.6 million people. That includes $175 million to Somalia. Swan said the transition period for the government must end if the many needs of the Somali people are to be properly addressed. He hopes the transition will conclude with the election of a new president next August. Jibril Mohamed, president of the Somali Community Action Network in Columbus, said the U.S. government cant dictate to Somalia what the new government will be. But he said hes glad the government appointed Swan to help lead American efforts to find a solution.Before he spoke to the community yesterday, Swan met with Mohamed Abdullahi Mohamed, Somalis former prime minister who served less than a year and is back home in Buffalo after he was ousted this summer. After meeting with the Somali community, Swan spoke at Ohio State Universitys Mershon Center for International Security Studies.mferenchik@dispatch.com Download the Flyer Here: Ambassador Swan's Visit to Columbus SomaliCAN Hosts USAID Roundtable with Ohio Somali Community Leaders Meeting With Somali-Americans About the Crisis in the Horn of AfricaPosted by Nancy Lindborg on August 02, 2011 at 06:12 PM ESThttp://www.whitehouse.gov/blog/2011/08/02/meeting-somali-americans-about-crisis-horn-africaThe face of famine is painfully personal for members of the Somali American communities in Columbus, OH and Minneapolis, MN. Yesterday, I led a community roundtable in each city, home to the two largest Somali diaspora communities in the United States. I was able to express deepest concern, on behalf of the US government, for the people of Somalia and update them on urgent relief efforts underway by the US government throughout the Horn of Africa, where a serious drought is affecting more than 11 million people. The USG is currently reaching more than 4.6 million people in the region who need emergency help, including $80 million of life-saving assistance to help 1.5 million people in accessible areas of Somalia. The UN has declared famine in two regions of southern Somalia where humanitarian access has been limited by Al Shabaab. USG is urgently supporting partnersto provide food, health, water and sanitation assistance wherever they can access communities desperate for help.I was also able to listen and learn from this dynamic community. Somali Americans are a vital lifeline of supportfor their communities and families throughout Somalia. I heard from dozens of community leaders who have mobilized their friends and neighbors to raise money for the drought through car washes, bake sales and fund drives. They are supporting feeding centers and health clinics. They have established NGOs dedicated to helping the growing number of orphaned children. A young woman in Minneapolis, choking back tears, described her Facebook page where she is raising money for drought relief and posting stories of families struggling to survive. As I heard from Jibril Mohamed in Columbus, In 1992 I was a boy who fled the conflict and drought of southern Somalia and did the same long walk to the border that families are doing now. Jibril is now determined to reach back with the same kind of helping hand he received.In Minneapolis, a number of Somali NGOs have joined forces with the American Refugee Committee (ARC) in an initiative called Neighbors for Nations which unites and mobilizes diaspora community efforts to provide relief and development services in Somalia. We have a short window of opportunity to reach the 2.85 million Somalis living in famine and conflict. The Somali American community is a critical partner in identifying ways to help save lives. We need urgently to ensure life-saving assistance reaches people now and are committed to doing so. I look forward to working with this dedicated group of citizens to save lives. Learn more about the U.S. Government response to the crisis in the Horn of Africa. Nancy Lindborg is USAIDs Assistant Administrator for the Bureau for Democracy, Conflict and Humanitarian Assistance.Chambers says Minneapolis-St. Paul have more Somali-Americans in their police departments and in elected office.“It’s much better, in many ways, in the Twin Cities than it is in Columbus, Ohio," Chambers says. "There are structures and institutions in the Twin Cities that have made it much easier for Somalis to reach somewhat of their potential.”She says that while Columbus has a ways to go in incorporating Somali-Americans, there are a few smaller changes it could start to implement. Those initiatives include recruiting Somali-Americans to be a part of the police force, having major political parties appeal to Somali voters, and pushing unions to offer leadership opportunities for immigrants. "We could also see a change in the ward structure at the city council level in Columbus, to make things a little easier for Somalis," Chambers says. "So kind of getting rid of some of the barriers that seem to limit political incorporation for Somalis in Columbus. And these barriers are just not present in the Twin Cities, and they've made an effort to get rid of barriers." SomaliCAN is honored and excited be hosting Mariam Mohamed in our first children's book Author-in-Residence at elementary schools this May. July 7th, 2017 at 6:00pm - 9:30pm at Hilton Columbus at Easton, 3900 Chagrin Drive. ﻿Columbus has the second-largest concentration of Somali immigrants in the U.S., following Minneapolis, which has almost double the population. Stefanie Chambers, who compared the two in her book "Somalis in the Twin Cities and Columbus," says Columbus still lags behind in incorporating Somali-Americans into the community. 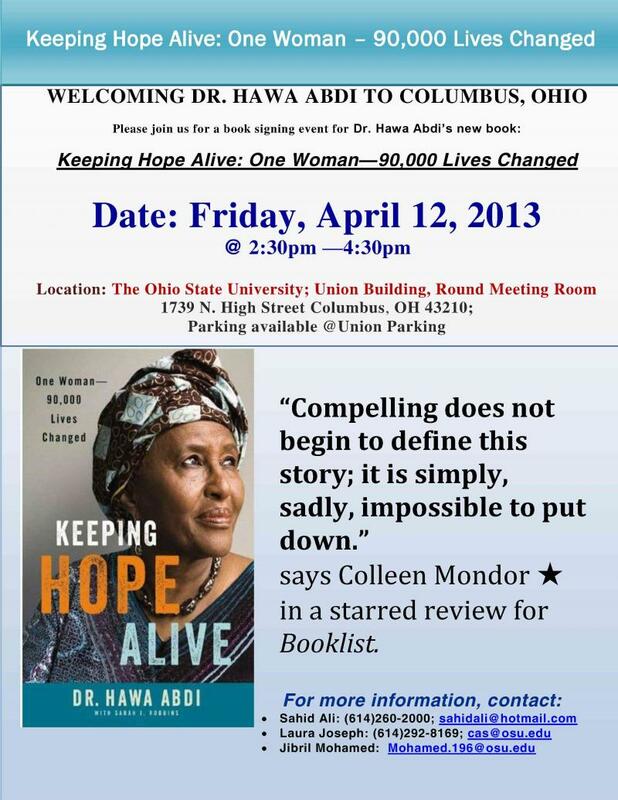 Book Signing @OSU Union on Friday, April, 12, 2013 at 2:30pm-4:30pm. Thank you Dinner and Book Signing @Solay Bistro on April 12, 2013 at 6:pm. REMEMBERING SOMALIA: A WRITER SPEAKS. We are pleased to invite you to join the Somali community in the most prominent Somali event in Ohio celebrating the academic achievement of Somali American high school and university graduates. 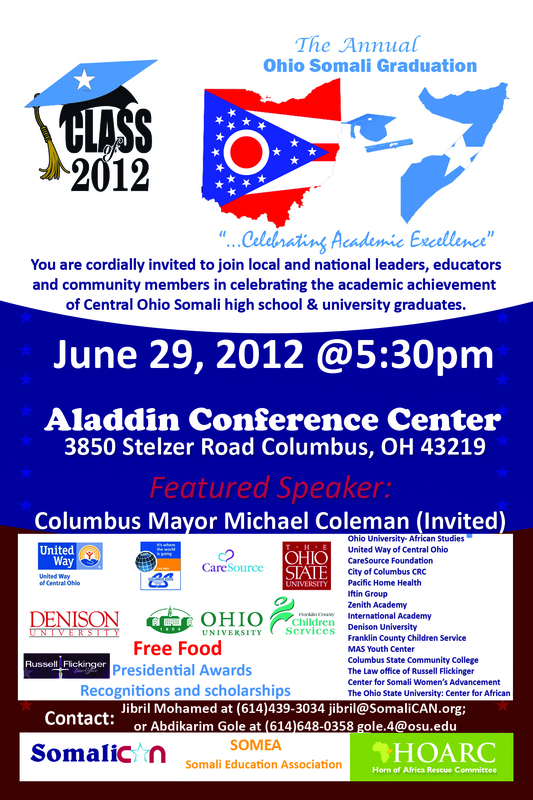 The Third Annual Ohio Somali Graduation and Scholarship Program will be held on Friday, June 29, 2012 at 5:30pm-10:00pm at Aladdin Conference Center, 3850 Stelzer Road. The graduation will bring together hundreds of students, parents, professionals and leaders from the state of Ohio and national leaders in education. Invited dignitaries include Ohio Governor John Kasich, Columbus Mayor Michael Coleman, Columbus Schools Superintendent Dr. Gene Harris; Westerville Schools Superintendent Dan Good, Southwestern Schools Superintendent Bill Wise, Governors Director of Minority Affairs Lynn Stevens, representatives from the Ohio State University, Ohio University, Columbus State, Denison University, Capital University, Franklin University, Ohio Department of Education, and other county, state and state officials. Somali community leaders and educators including the first African man to receive a PhD from Princeton University and former Ministers will be honored at the event. In addition to financial scholarships by the Law Office of Russell Flickinger, Presidential Service Awards will be conferred on members of the Somali-American community in recognition of their contributions to the community. In previous years, the event attracted media coverage by the Associated Press, BBC, Voice of America, Columbus Dispatch, NBC4, Cleveland.com and other local and international media. Somali graduates in Ohio, their parents, and friends are cordially invited to be honored in this beautiful celebration of education excellence by the Somali American community. Should you need more information about the event, please do not hesitate to call 614-439-3034 or send an e-mail to Graduate@SomaliCAN.org. We look forward to seeing you on June 29, 2012 at 5:30pm at Aladdin Conference Center, 3850 Stelzer Road. Join a roundtable discussion with USAID staff on stablization initiatives in Somalia on July 4, 2012 at Solay Bistro. Click on the title to download the event flyer. On Wednesday, May 16, 2012, (2:00-3:30pm) a delegation from the U.S. Department of State, led by Amb. Donald Yamamoto, the Principal Deputy Assistant Secretary of State for African Affairs will be in Columbus, Ohio for consultation with the Somali community in Ohio about ...the end of transition process and expansion of AMISOM troops in Somalia. 11:00a.m - 1:30p.m: Lunch with Leaders at Solay Bistro. Donald Yamamoto's prior assignments included serving as the U.5. Ambassador to the Federal Democratic Republic of Ethiopia from November 2006 to July 2009. He also served as Deputy Assistant Secretary of State in the Bureau of African Affairs from 2003 to 2006, where he was responsible for coordinating U. S. policy toward over 20 countries in east and central Africa. He served as U.S. Ambassador to the Republic of Djibouti from 2000 to 2003 and was the Deputy Director for East African Affairs from 1998 to 2000. Ambassador Yamamoto entered the Foreign Service in 1980. Former assignments include U.S. Embassy Beijing as Ambassador's staff aide and Human Rights Officer during the Tiananmen Square demonstrations in 1989; Japan as Principal Officer of the Fukuoka Consulate; and Eritrea as Charge d'Affaires at U.S. Embassy Asmara in the Horn of Africa. He attended the National War College in 1996 for senior training and received a Congressional Fellowship in 1991. Ambassador Yamamoto is a graduate of Columbia College and did graduate studies at Columbia University, receiving a Master's degree in International Affairs. He has studied Chinese, Japanese, Arabic, and French. During his Foreign Service career, he has received four individual Superior Honor awards, two group awards and the 2006 Robert Frasure Memorial Award for advancing conflict resolution in Africa. Directions to the meeting: To get to the Ohio Department of Developmental Disabilities building, you have to turn off Broad St. onto the I-70 East Bound Entrance Ramp. There will be a small green sign under the Freeway entrance sign that says 1601 W. Broad St. The driveway is off to the right before entering the freeway. The building is at the top of the hill and marked Administration. If you pass the turn-off ramp, you will enter onto the freeway and will have to get off at the next exit and backtrack. Federal Official Urges Local Somalis to Aid their Broken Country: The Columbus Dispatch. Somalia, which hasnt had a national government in more than two decades, faces a host of complex problems including famine, religious extremism, piracy and a flood of refugees. 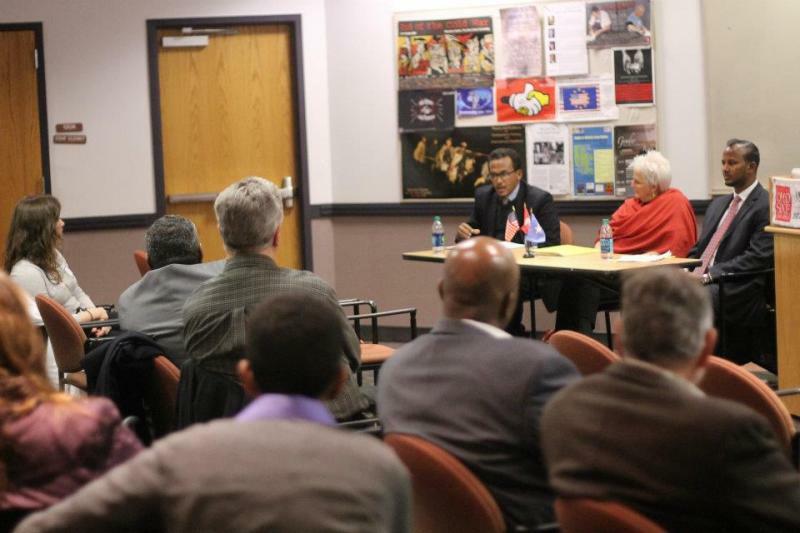 Friday and Saturday, local Somali leaders and academics and State Department representatives will meet at Ohio State University to discuss these problems and how they affect the U.S. and Somalis who have moved here. Somalia at Crossroads: Foreign Intervention, Humanitarian Crisis and Aspirations for Statehood, will include speakers discussing U.S. policy, the ongoing humanitarian crisis and difficulties in sending money to relatives there. There has to be a solution that brings all those territories together so regions and communities can function at the local level, said Mohamud, a member of the organizing committee. He served as Somalias minister of education for nine months until the prime minister was forced out in June. Why not take the initiative ourselves, with the idea of bringing our people together, getting the government of the U.S. involved, get something concrete, and come up with some recommendations, said Jibril Mohamed, who leads the Somali Community Access Network in Columbus. At 7 on Friday night, Deborah Malac, director of East African Affairs for the State Department, and Abukar Arman, Somali envoy to the U.S., are scheduled to speak about U.S. policy in Somalia at the Mershon Center for International Security Studies, 1501 Neil Ave.
Other events are set for Hagerty Hall, 1775 College Rd., Friday morning and Saturday, and Denney Hall, 164 17th St., for Friday afternoon sessions. Columbus is home to many who fled the anarchy into which the African nation of Somalia descended beginning in the early 1990s. Now, in 2012, the city may be home to the beginnings of an end to the violence and bloodshed that continues to wrack the country. A conference entitled Somalia at Crossroads: Foreign Intervention, Humanitarian Crisis and Aspirations for Statehood will be held from 9 a.m. to 5 p.m. Jan 27 and 28 in Hagerty Hall, 1755 College Road, and Denney Hall, 164 W. 17th Ave., both on the campus of Ohio State University. Conference sponsors include the Ohio State University Somali Language Program, Center for African Studies at OSU, Mershon Center for International Security Studies, African Studies Program at Ohio University, Columbus Council on World Affairs, Somali Community Access Network, Somali Education Association and U.S. Global Leadership Coalition. Somalia has been in a state of violence and conflict for over two decades now, Jibril Mohamed, president and chief executive officer of the Northland-based Somali Community Access Network, said last week. Many attempts were made to bring together the sides that were fighting for power in Somalia. So far, almost all of them are not successful. Approximately 16 conferences have been held in recent years in a variety of countries surrounding Somalia and in the Middle East, Mohamed added. All of those resulting in nothing much more than a transitional system that was not functioning, he said. The local conference seeks to bring together intellectuals, Somali and non-Somali, who have a deep understanding of whats going on in the strife-torn nation, he indicated. They envision ways to handle that conflict and end it once and for all, Mohamed said. Ambassador Johnnie Carson, Assistant Secretary of State for Africa at the U.S. State Department, was invited to be one of the speakers but will not be able to attend, according to Mohamed. However, he will be represented by a delegation of officials from the State Department. Professor Ahmed I. Samatar, the James Wallace Professor of International Studies at Macalester College in St. Paul, Minn.
Elected state and local officials have also been invited to address the conference. The conference has three major goals, according to Mohamed. The first is to produce a communiqu by the end of the gathering stating the position of conference attendees on the way to move forward after the current transitional government in Somalia ceases in August. Second will be to bring to the attention of policymakers, including those in the U.S. State Department, the frustration Somali-Americans feel regarding the continued violence in their homeland. And third, Mohamed said, will be to show that Columbus and its Somali community are powerful, capable of thinking about our motherland and finding solutions for them, and following them up with actions. Thats the country that gave us the life that we have, Mohamed said. Thats where we were born. Most Somalis have relatives and friends in Somalia. There is a great connection between the Somali-Americans and the Somalis living in Somalia. Debunking the Roadmap: A Tool for Statehood or Death-knell for Disintegration? Post-Transitional Federal Government Somalia: Political Parties and National Grassroots Movements as Clan Alternatives: Planting the Seeds for Sustainable Social and Political Institutions. For decades, Somalia has been plagued by myriad problems famine, violence, piracy and thousands of refugees and not everyone agrees on how to solve them. During a panel discussion yesterday at Ohio State University, centered on U.S. engagement in Somalia, speakers were critical of the current administrations policy aims. The most-important part is the security of the Somali people themselves, said panelist Jibril Mohamed, CEO and president of the Somali Community Access Network in Columbus. Theres no policy of securing the people; its the Somali people who suffer the most. Its the Somali people who are the victims. Somali people are dying in droves from famine and violence. There needs to be a comprehensive policy that takes into account the Somali peoples needs. Mohamed helped organize the conference, Somalia at Crossroads: Foreign Intervention, Humanitarian Crisis and Aspirations for Statehood. The Obama administration has pursued a dual-track policy toward Somalia since 2010. Under this approach, the U.S. supports the weak transitional government while simultaneously engaging local and regional leaders to cultivate peace and stability. Deborah Malac, director of the U.S. State Departments Office of East African Affairs, defended U.S. policy at a press roundtable after the panel discussion. We would argue that there is demonstrated progress and success for the dual-track policy, Malac said. But as we do with any policy we look at the situation on the ground and make determinations on when and whether we need to make adjustments to that policy. It is going to be a painstaking process to move things forward in a positive direction. Malac was invited to give the keynote address last night at the conference, which will conclude today. 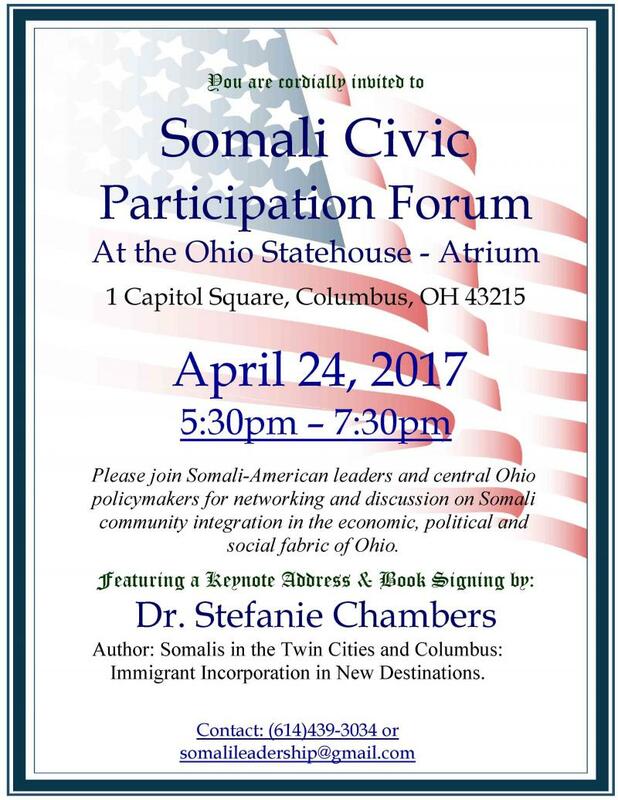 She added that U.S. Somalis many thousands of whom live in Columbus have an important role to play in determining policy. We understand that having a connection to them is something we need to do to ensure that we have that flow of ideas or an understanding what the impact of what our policies might be, she said, adding that violence is a major concern among Somalis. They take every opportunity to try to get that message to us to put pressure on us to keep doing something. Mohamed said he was one of two Somalis invited to attend a 2010 forum at the White House, where the president unveiled his administrations strategy in Somalia. Mohamed said he hopes Somalis will have the opportunity to actively shape alternative plans. Receiving the input of the Somali diaspora and Somali intellectuals, Somali activists and Somali technocrats would be essential to obtaining a policy that is feasible and sustainable, he said. Deanna Pan is a fellow in the E.W. Scripps School of Journalism Statehouse News Bureau. COLUMBUS, Ohio (AP) Somalia's numerous problems, from piracy to humanitarian suffering to receiving money from overseas immigrants, are the subject of a two-day conference at Ohio State University. The previously scheduled conference comes just days after U.S. special forces rescued two hostages inside Somalia and killed nine captors in the process. The Somalia at Crossroads conference begins Friday and includes Somali officials, academic experts and a representative from the U.S. State Department. Columbus has as many as 20,000 Somali residents, the country's second-largest population after Minnesota. Somalia at the Crossroads Conference: Foreign Intervention, Humanitarian Crisis and Aspirations for Statehood. The Ohio State University. Columbus, Ohio, USA. Ms. Laura Joseph at OSU 614-292-8169. * Debunking the Roadmap: A Tool for Statehood or Death-knell for Disintegration? * Post TFG Somalia: Political Parties and National Grassroots Movements as Clan Alternatives: Planting the Seeds for Sustainable Social and Political Institutions, and more. For additional details, contact: Mr. Jibril Mohamed (614)439-3034 or Jibril@SomaliCAN.org, Mr. Abukar Osman- Baalle (614) 769-8810 or Ms. Laura Joseph at OSU 614-292-8169. U.S. Involvement in Somalia: A Policy of Tacit Engagement or Disengagement? Mershon Center for international Security Studies, the Ohio State University. For more information including directions, please CLICK HERE. United States Special Representative for Somalia, Ambassador James Swan will discuss Americas Dual Track Engagement Policy for Somalia. His remarks will provide an overview of Americas role in supporting humanitarian, development, and security assistance in Somalia. He will also address U.S. programs designed to promote good governance, transparency and accountability within Somalias transitional federal and regional administrations. Ambassador Swans remarks will be followed by a question and answer session. Ambassador James Swan has served as the United States Special Representative for Somalia since August 2011. He has served with the State Department since 1988 in Djibouti, Democratic Republic of the Congo, Republic of Congo, Cameroon, Haiti, and Nicaragua, as well as Deputy Assistant Secretary of State for African Affairs (2006-2008). For details, please contact Jibril Mohamed at (614)489-9226 or SomaliCAN@gmail.com or Laura Joseph at cas@osu.edu. 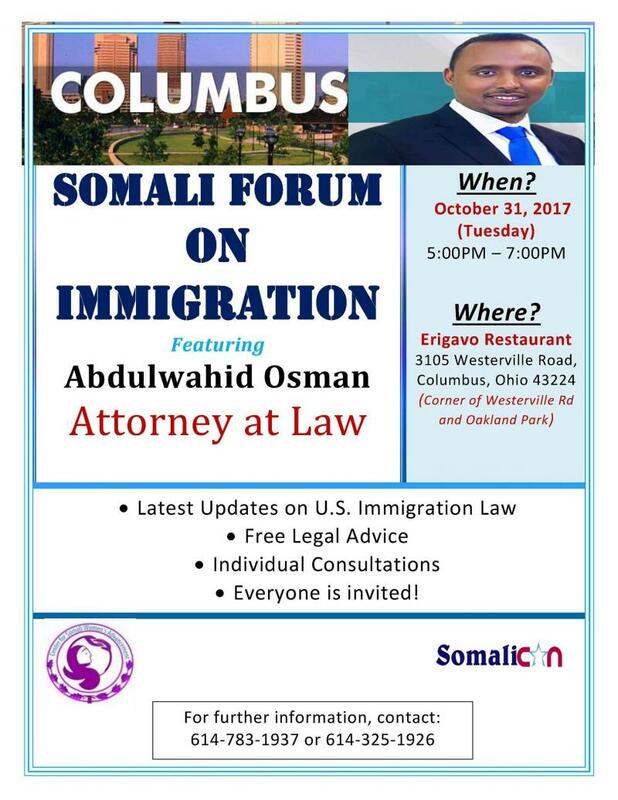 Im pleased to have the opportunity to speak with you tonight in Columbus -- a city that is one of the most important centers of the Somali diaspora in the United States. Somalis in America are not only active contributors to their newly adopted communities, but also continue to follow, and more importantly, influence developments in Somalia. So it was a priority for me to engage in a dialogue and learn from the Somalia diaspora in the first few months of my new assignment as the U.S. Special Representative for Somalia. The difficulties that beset many parts of Somalia today: chronic instability, weak governance, famine and terrorism, have led some commentators to say that America should scale back its engagement with Somalia. They see heart-breaking news coverage of malnourished Somali children, read about bright young college students murdered by suicide bombers, or hear reports of wide-scale corruption and say that Somalia cannot be helped. The problems Somalia faces today, the critics say, are the same problems it has faced for twenty years. They are intractable, they are expensive their argument runs so why bother? The answer is simple: Americas national interests require robust engagement with Somalia. As a compassionate society, the United States has an interest in addressing the acute humanitarian needs of our fellow human beings in Somalia. As part of our global commitment to advancing democratic values and improved governance, we have an interest in promoting political reforms that allow Somalis to be represented by leaders who will govern for the benefit of the people and the development of the country. The United States also has direct security interests in Somalia. The combination of instability and poor governance threatens not only the Somali people, but the security of our regional partners in the Horn of Africa and beyond. These factors have led to the most serious piracy problem in the world on key international trade routes. They have also created a dangerous terrorist organization al Shabaab that wantonly attacks innocent civilians and African peacekeepers, has conducted terrorist attacks against Somalias neighbors, and has actively recruited American citizens. For all these reasons humanitarian, democracy and governance, and cold-eyed security concerns America is committed to helping Somalia regain stability and security. While Somalia faces enormous challenges, it also has, to quote President Obama, enormous support from the people of the United States. We are committed to working with Somalis and the international community to help develop indigenous, long term solutions to the countrys ongoing problems. America, as President Obama also said, wants Somalia to succeed. Success means that Somalis facing drought and famine are helped to survive the current crisis and are given the long-term tools to better withstand future droughts. Success means that Somalia is free from totalitarian terrorist groups like al Shabaab, which is responsible for many lost and shattered lives not only in Somalia, but in Kenya and Uganda, through its terror attacks and through its policy of banning humanitarian assistance. Success means that Somalis can turn to their government for the basic services that we take for granted in America. It means that humanitarian and development assistance goes where it is needed and not into the pockets of corrupt officials or the armories of warlords and terrorists. And success means that the Somali people get to decide what form of government and constitution they will have. Poll after poll shows that the Somali people want self-determination, even if they are unclear exactly how that democracy should look. Our role is to support the Somali people as they arrive at these decisions. Let me turn first to the current humanitarian crisis, which has been so much in the headlines in recent months. The scale of the crisis is shocking. Nutritional data released by the Food and Agriculture Organization in early September spoke of 4 million people in need of assistance in Somalia alone, with more than three times that number at risk elsewhere in the region. To address the immediate crisis, the United States has provided over $750 million to meet ongoing and urgent humanitarian needs in the region. Approximately $175 million of those funds are for humanitarian assistance within Somalia. Our dollars and diplomatic leverage are also being used to provide protection and assistance for Somali refugees in Kenya, Ethiopia, and Djibouti. While America is the largest donor of humanitarian assistance to the Horn of Africa But, we are not alone. European partners, Turkey, Gulf Cooperation Council countries, China, Japan, and many others have all responded to Somalias urgent need. Together, we have met nearly 80 percent of the $1 billion UN Consolidated Appeal for Humanitarian Assistance for Somalia, the highest percentage reached of any appeal in the world today. In addition to aid from governments, there have been significant contributions from private citizens and NGOs from around the world. In many respects, our core humanitarian challenge is not only to continue to mobilize the necessary resources, but also to ensure that all donors and implementing agencies are coordinating their response for maximum efficiency and effect. The areas worst affected by the famine are not coincidentally those where the extremist group al-Shabaab is most influential. Though assistance is beginning to reach these areas, coverage is uneven and continues to be impeded by al-Shabab in many places. We call on al-Shabaab to remove urgently all remaining obstacles to aid delivery in areas where they are present. Although humanitarian access is far better in areas of Transitional Federal Government presence, we believe this could be further improved through efforts to establish more effective TFG aid-coordination systems and address the problem of small armed bands that control entry to some Internally Displaced Persons (IDP) sites. The TFG should make areas it controls a model of effective aid delivery. There is also something that you can do. You may be surprised to know that more than 54% of Americans have no idea there is even a crisis in the Horn of Africa region. To highlight the devastating crisis, USAID, working with the Ad Council, launched the F.W.D. or forward campaign for the Horn of Africa. F.W.D. stands for Famine. War. Drought. - the three factors that make the crisis so severe. Today, November 9th, is FWD>Day a national day of action for Americans. Today we are asking that 13.3 million people, the same number of people impacted by the crisis, take action to raise awareness for the Horn of Africa. We are asking people to take an action by (1) posting messages on Facebook and Twitter about the crisis, (2) making your own FWD video on YouTube, and (3) texting Give to 777444 to donate $10. Beyond the immediate crisis, our primary vehicle for advancing broader U.S. interests in Somalia is the Dual Track policy announced on October 20, 2010 by Assistant Secretary of State for African Affairs Johnnie Carson. Under Dual Track, our diplomatic engagement and development assistance for Somalia is steadily increasing. This year alone the United States we will provide over $250,000,000 dollars for Somalia. These funds support a vast array of programs, across the entire country, that address security, peace and reconciliation, conflict mitigation, good governance, justice, democracy, education, economic growth, private sector competitiveness, health, water sanitation, food security, nutrition, and protection for vulnerable peoples. Track one of the Dual Track policy reaffirms Americas continuing support for making the Transitional Federal Institutions more effective, more inclusive, and better able to provide services to the Somali people. Track One is consistent with our support for the Transitional Charter and Djibouti Peace Process. Track one also reaffirms our continued support for the African Union Mission in Somalia (AMISOM) peacekeepers who defend those institutions. The Second Track of Dual Track broadens our engagement with regional and local administrations, civil society groups, and communities across the country that share the same goal of defeating al-Shabaab and bringing peace and stability back to Somalia. In reality, the Second Track announced last year codified efforts that were already underway to expand outreach to communities and organizations that were creating pockets of stability and improved governance. Key administrations and organizations we engage under Dual Track include Somaliland, Puntland, Galmuduug, Ahlu Sunna wal Jamaa, other local administrations, and civil society groups. The past year has seen important progress on both tracks of Dual Track. On Track One, the Transitional Federal Government and AMISOM have succeeded in retaking ninety-eight percent of Mogadishu from al-Shabaab. This is a significant accomplishment in the security arena and one that has led to increased humanitarian access in newly liberated parts of the city. Mogadishu has been the scene of the fiercest battles in the country as al Shabaab struggled to keep its grip on the city that remains the economic heart of the country and has historically been its political epicenter as well. While al Shabaab has lost territory and support over the past year, it remains a very dangerous organization within Somalia and our support to the Somali forces and the Ugandan and Burundian troops deployed alongside them in Mogadishu will continue. The United States supports the Somali National forces with stipends, training, and equipment, and has also provided the lion's share of equipment and training for the AMISOM troop-contributing countries ever since their first deployment in 2007. On the second track, we have increased outreach and support to key regional administrations and local governments across the country that are providing stability and services and countering al-Shabaab. Somaliland, for example, emerged from a successful presidential transition last year, a process the United States supported with over $700,000 in assistance. Having clearly progressed on democratization, the Somaliland administration has also successfully attracted new investment. That is why the United States more than doubled its assistance to Somaliland under Dual Track, going from about $8 million in 2009 to more than $20 million in 2010. This funds programs focused on local government administration and planning, education, community development initiatives, and economic growth. We plan to extend the same type of Track Two community development assistance programs to Puntland, Galmuduug, and accessible areas of Gedo Region in the coming months. Even in Mogadishu, our quick impact community-focused projects are channeled through the Benadir Administration in order to reinforce local ownership and keep the projects close to the people. We know Dual Track also has its critics. Some claim the policy has undercut the influence of the Transitional Federal Government, but this ignores our continued support to both the TFG and AMISOM. There are those who claim Dual Track further Balkanizes Somalia, pointing to opportunists who quickly self-declared newly independent states states that often represent little more than a hastily-posted website in a foreign capital. The Second Track is in no way an open-ended commitment to assist any regional entity. We are focused on looking for opportunities to help political structures that enjoy real legitimacy with their constituents and have a record of building pockets of stability within Somalia and responding to the people. We want to help Somalis living in such communities, even while Somalis as a whole decide what sort of relationship they want between their central and regional governments. When it comes to recognizing new African states, America follows the African Union lead -- and the African Union supports a single Somali state. On both tracks, we will continue to provide training to local authorities and targeted Transitional Federal Institutions to promote credibility and confidence in the peace process. This includes funding activities to support constitutional and democratization processes across the country. It also includes training, often with the expertise of Somali diaspora like yourselves, to promote government transparency and responsiveness. A great recent example includes a member of the diaspora who returned to work with the TFG. He identified $1 million dollars in lost assets, funds which belonged to the defunct Somali national airlines that were sitting unused in banks, and restored these assets the national budget. Let me turn now to the national political process. Ultimately the ability of Somalia to address future humanitarian challenges; improve security for its people; and pursue a strategy for development of the country will require resolution of political conflicts and establishment of functional governing institutions. If Somali political leaders want to garner credibility with the Somali, they must capitalize on the improving security environment to make significant progress in both the political and governance realm. Many Somalis still express a deep skepticism about the Transitional Federal Institutions ability or willingness to govern in a representative, responsive and accountable manner. Much of their frustration comes from the perception that the Transition Federal process begun in 2004, which was supposed to provide the constitutional, electoral and parliamentary foundation for a new Somalia, has become hopelessly stalled. In the eyes of many of their constituents, the political leadership in Mogadishu has become complacent with the status quo, and the benefits it affords those in power, rather than committed to progress that will help the average Somali. On September 6, however, these Somali leaders created a unique opportunity to change that perception. On that day, Somali leaders from the Transitional Federal Government, the regional administrations of Puntland and Galmuduug, and the Ahlu Sunna Wal Jamaa movement signed the Roadmap for Ending the Transition in Somalia. It is a hopeful indication that previously competing administrations see the benefit of coming together to end the static transition period that increasingly serves the interests of the few at the expense of the many. Although the Roadmap includes a complex list of tasks and deadlines to be met that may be overly ambitious, its broad thrust of (1) improving security, (2) extending political outreach to all regions, (3) completing the constitution, and (4) ensuring representative institutions and good governance is right on target. The Roadmap has given new impetus to the completion of key transition tasks such as the drafting of a constitution, and electoral and parliamentary reform. But some Roadmap deadlines have already slipped and it is urgent that senior Somali political leaders from the signatory parties together actively provide political direction to spur the process forward. The terrible suffering of the Somali people, particularly during the current famine, underscores that the signatories must make rapid progress toward representative and effective governance that can meet the basic needs of all Somalis. We are closely monitoring progress on the Roadmap. We will continue to support the efforts of those who strive to achieve its goals and bring stability back to Somalia. Equally, we will work with our regional and international partners to hold accountable those Somali officials who obstruct progress. For all the challenges Somalia continues to face, we have seen positive though still fragile results from the efforts that we and our Somali, African, and international partners have expended. This years humanitarian response has been massive, and now needs follow-through and improved coordination to ensure the necessary effect. In the security arena, momentum has shifted from al-Shabaab to the TFG and AMISOM -- although al-Shabaab still remains dangerously capable of asymmetric attacks. Politically, the Roadmap offers a positive vision for the end of the transition and also the prospect of convergence between the national government and regional entities, but it needs strong direction by Somali political leaders and active regional and international engagement to keep it on track. There is of course still much work to be done to address all of these challenges. It is time for all of us -- especially those in the diaspora -- to add our voices to those of the millions of Somalis calling for end the transition period and a new era of security, inclusiveness, and development in which Somalia can rebuild. James C. Swan, the new U.S. special representative for Somalia, wanted to hear from Columbus Somalis about U.S. policy in their homeland. For some in the Somali diaspora, Swans appointment indicates to them that the United States is willing to take a lead in helping to resolve the many problems that have fractured the war-torn country for 21 years. Abdi Issa was direct when he spoke to Swan. You have an opportunity to make it or break it, Issa told Swan. He wants the United States to provide more humanitarian support to help stabilize the country. We need an American action immediately, said Issa, who is a village council member in Urbancrest. You have all of our support. Swan was appointed in August and is based in Nairobi. 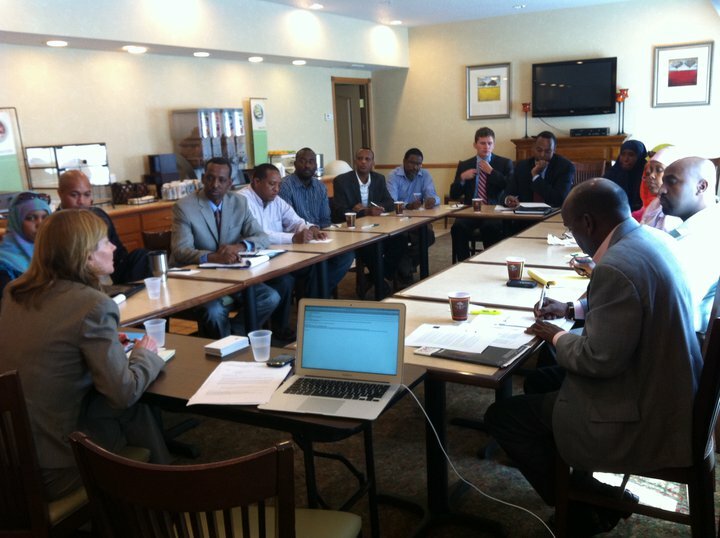 He came to Columbus to speak with about 60 Somalis at Monacos Palace in the Northland area. The Obama administration has pursued a dual-track policy of supporting the weak transitional government while talking to leaders in regions such as Somaliland and Puntland anyone who isnt supporting the extremist al-Shabab group that is linked to al-Qaida. Al-Shabab has been battling transitional government and African Union peacekeeping forces while thwarting relief aid from reaching the people who need it. The United States has provided $750 million in humanitarian aid to drought-stricken regions in the Horn of Africa, reaching 4.6 million people. That includes $175 million to Somalia. Swan said the transition period for the government must end if the many needs of the Somali people are to be properly addressed. He hopes the transition will conclude with the election of a new president next August. Jibril Mohamed, president of the Somali Community Action Network in Columbus, said the U.S. government cant dictate to Somalia what the new government will be. But he said hes glad the government appointed Swan to help lead American efforts to find a solution. Before he spoke to the community yesterday, Swan met with Mohamed Abdullahi Mohamed, Somalis former prime minister who served less than a year and is back home in Buffalo after he was ousted this summer. 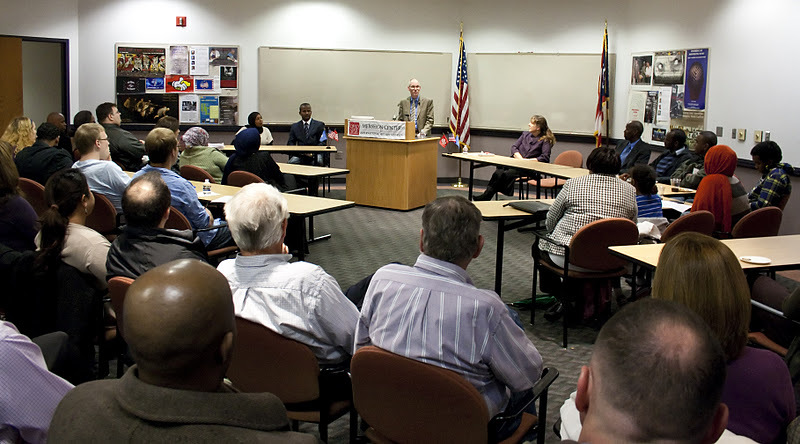 After meeting with the Somali community, Swan spoke at Ohio State Universitys Mershon Center for International Security Studies. The USG is currently reaching more than 4.6 million people in the region who need emergency help, including $80 million of life-saving assistance to help 1.5 million people in accessible areas of Somalia. The UN has declared famine in two regions of southern Somalia where humanitarian access has been limited by Al Shabaab. USG is urgently supporting partnersto provide food, health, water and sanitation assistance wherever they can access communities desperate for help. I was also able to listen and learn from this dynamic community. Somali Americans are a vital lifeline of supportfor their communities and families throughout Somalia. I heard from dozens of community leaders who have mobilized their friends and neighbors to raise money for the drought through car washes, bake sales and fund drives. They are supporting feeding centers and health clinics. They have established NGOs dedicated to helping the growing number of orphaned children. A young woman in Minneapolis, choking back tears, described her Facebook page where she is raising money for drought relief and posting stories of families struggling to survive. As I heard from Jibril Mohamed in Columbus, In 1992 I was a boy who fled the conflict and drought of southern Somalia and did the same long walk to the border that families are doing now. Jibril is now determined to reach back with the same kind of helping hand he received. Nancy Lindborg is USAIDs Assistant Administrator for the Bureau for Democracy, Conflict and Humanitarian Assistance. Chambers says Minneapolis-St. Paul have more Somali-Americans in their police departments and in elected office. She says that while Columbus has a ways to go in incorporating Somali-Americans, there are a few smaller changes it could start to implement. Those initiatives include recruiting Somali-Americans to be a part of the police force, having major political parties appeal to Somali voters, and pushing unions to offer leadership opportunities for immigrants. "We could also see a change in the ward structure at the city council level in Columbus, to make things a little easier for Somalis," Chambers says. "So kind of getting rid of some of the barriers that seem to limit political incorporation for Somalis in Columbus. And these barriers are just not present in the Twin Cities, and they've made an effort to get rid of barriers."